Android High Tea: Oculus Rift and 3d printing! A setup before the Gallery opened. Android Tea VR was a step inside a boutique of the future. Delicate 3d printed porcelain will adorn the tables and android automata will abound. 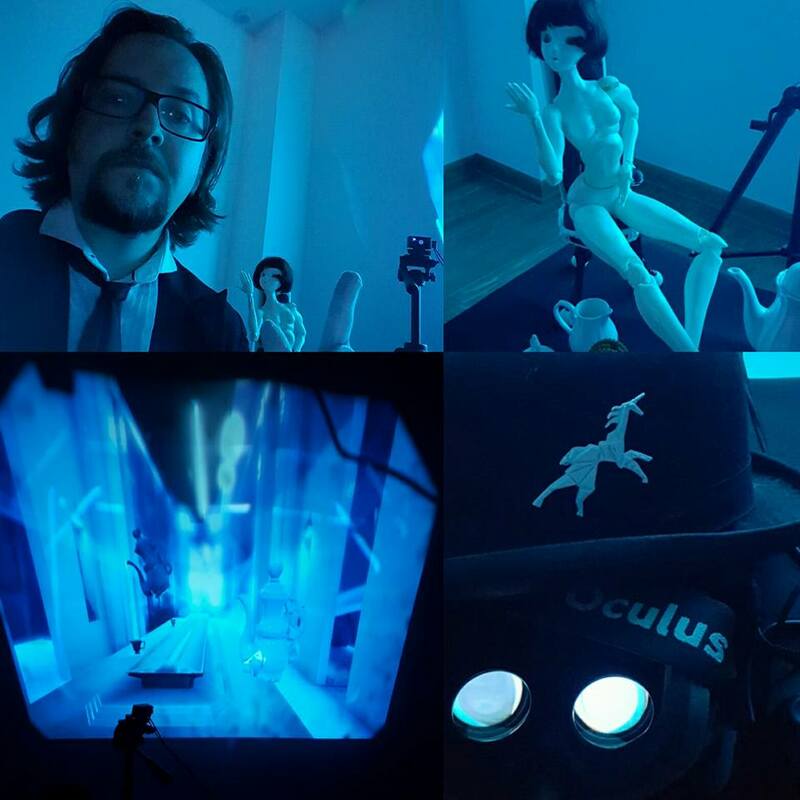 This real time Oculus Rift Game allowed the user to experience a preview to a larger Cyber Victorian High Tea. One could hear the sounds of synthoid harpsichord from upstairs, smell tea, and detect the presence of cucumber sandwiches on the wind. WHAT WILL IT EVOLVE INTO? This will become a S.T.E.A.M focused Android building game, looking to help young makers learn the principles underlying scientific thinking and a whole new design approach using additive manufacturing. They will become part of a story of a struggling shop owner, who runs a failing android boutique, while they are trying to create their own masterpiece in art and robotics. The app will be a place where the user can try out different unlock-able parts and create their own unique androids while getting help along the way from the Boutique’s Ghostly AI agents. When they’ve got something they think is worthy of trying out in reality, the user will be able to print out their designs on a 3d printer via a direct link to our printing network or directly to their computers. It will be sold in Modules, starting with the Science Module, then the Technology, Engineering,Art, and Mathmatics Modules. Each one will allow the user to create more advanced BJD androids while telling more about the story of Zarianna and her Creator. Only with your interest and feed back@jimzello will this be able to happen. Like Unicron Studios on facebook to help support the project and get updates on progress and eventual Kickstarter Status. Jim Is a Self taught 3d Artist and an avid Futurist. He has been working commercially in the 3d industry for 19 years. His passion for 3d has transcended the virtual with the process of 3d printing. There is a new design revolution on the horizon, and he intends to explore the methods of design, engineering, and material integration in the projects he has begun. His vision is to spread that knowledge through software and eventually a network of physical Maker labs that allow kids ages 7-17 to have a safe and whimsical place to hang out and create amazing things by themselves or together. His approach to education is by way of how he learns new things. First, you want to obtain a result, so then you learn the underlying principles at work, then you attempt to falsify your working hypothesis via interaction and practice. If you are right, you have the dual benefit of understanding how to do something but also, you know how you know WHAT you know. That is his favorite way of doing art, design, and visual effects. He knows that this is applicable in a broad spectrum of human activities. Introducing the underlying principles as a game mechanic, for which the solution can be arrived at via mastery and interactivity, is key to unlocking the creative force in everyone. That is his goal for the project outlined above. Jim also has a Bachelor’s in Studio Art from Florida State, with a minor in Business.